I have to say, when the Jeep JL Wrangler first came out, I was pretty impressed with the front axle and all the improvements made to it. Clearly, someone was paying attention to the kinds of bends and breaks we were seeing on the JK Wrangler front axle and it was nice to see these new axles came with beefier brackets, significantly bigger end forgings and of course, larger diameter tubes. However, now that a year has gone by, I have to say that I’ve reeled in my opinion of it a bit and mainly for dumb things like the drain bolt being located directly on the bottom of the differential and of course, the FAD. But, if there is one real concern of mine, it’d be with the axle tubes. Although rare, I have personally seen several JK Wrangler Rubicon front axle housings break over the last 12 years. This is of course, no real surprise being that the Rubicon 44 front axle was only a 44 in name and mainly because of its differential and axle shafts. The tubes on it were still just 2.50″ in diameter with a 0.25″ wall, just like a Dana 30 and a true 44 would have 3″ diameter tubes. Needless to say, with the JL Wrangler having tubes that are closer to 3″ in diameter, 2.75″ to be exact, I was hopeful that they would hold up a lot better but then, I started seeing the same kind of breaks that we saw with the JK. To be fair, the breaks I’ve seen so far did occur on JL’s that were running hard and fast and in one case, the JL in question crashed into a large rock but even at that, I personally don’t think the axle housing should have snapped in half the way they did. It should be noted that both breaks did occur on the passenger side and at the location of the FAD and that is something most of us thought could happen. However, it was only after the breaks that we started to learn just how thick, or should I say, just how thin the wall is of the axle tubes. 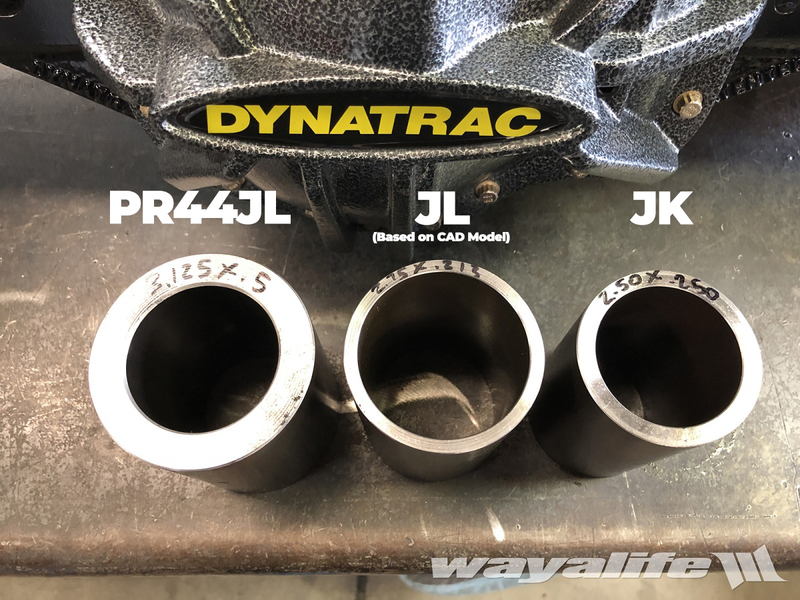 Thanks to our good friends over at Dynatrac, we got to see first hand what a JL Wrangler front axle tube looks like compared to a JK Wrangler’s. As you can see in the photo below, the JL tube measures 2.75″ which is larger than the 2.50″ of the JK but the wall on it is only 0.213″. The JK tube was at least 0.25″. CORRECTION: A Physical measurement of the JL Wrangler tubes show them to have a wall that measures 0.281″. This is in fact slightly thicker than what came on a JK Wrangler. Now, don’t get me wrong, a thicker wall doesn’t necessarily make a tube better. A thin wall tube with a large cross section can offer the same amount of strength as a smaller diameter tube that has a thicker wall and without having the same weight penalty. So, if the JL front axle tubes should be plenty strong in spite of the thinner wall, why bring it up, right? Simply put, the JL Wrangler axles are wider! The JL Wrangler Sport and Sahara have axles that measure 66.50″ wide and that makes them 1″ wider than what came on a JK Wrangler. Also, a JL Rubicon has axles that measure an impressive 68″ wide and that make them 1.50″ wider than a Sport or Sahara and a whole 2.50″ wider than a JK. I should note, full width axles typically measure 68.50″! What I’m trying to say is that it’s more likely than not that Dana increased the tube diameter of the JL front axle to help compensate for the greater loads created by the wider width of the JL and to help reduce weight and not necessarily to help make it stronger than before. If anything, I don’t think it would be a stretch to say that a JL Sport or Sahara housing would be a bit stronger than a JL Rubicon’s being that they they use the same tubes and are narrower. And so that there’s no confusion, I am specifically talking about the “housing” and NOT the axle shafts or gears. 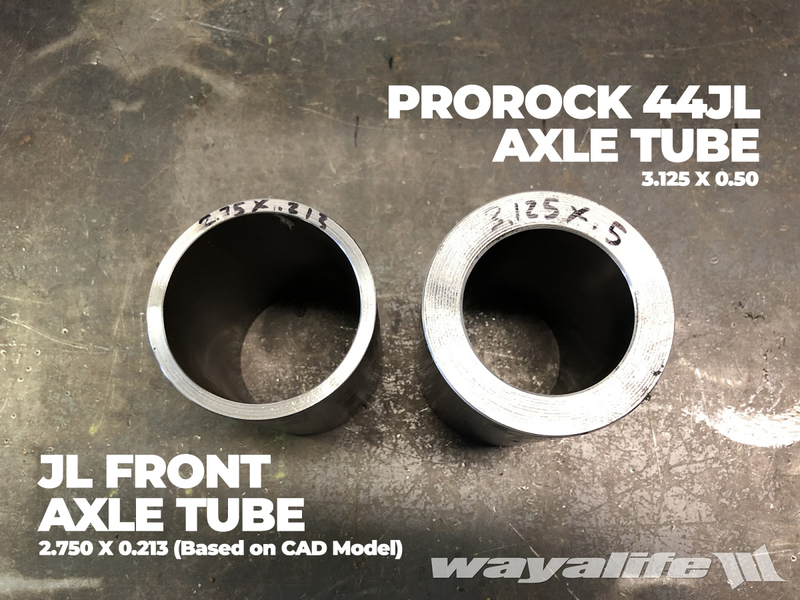 For comparison sake, the photo below is what a JL Wrangler front axle tube looks like next to the standard tube that is used on a Dynatrac ProRock 44JL. Here’s one more shot that shows what a Dynatrac ProRock 44JL tube looks like next to a JL tube and a JK tube. While I would be the first to say that the factory front axle on our JL Wrangler Rubicon has been holding up, I’d be lying if I said that we’ve been pushing it as hard as we could or as hard as we’d prefer, especially after seeing the breaks that we have. Be the first to comment on "Sure it’s Bigger… but is it actually Better? DISSECTING the JL WRANGLER Front Axle"